The New Form I-9 Will Be Required Soon. Are You Ready? On November 22, 2016, USCIS published the new Form I-9 which is required to be used by all employers beginning January 22, 2017. To avoid harsh penalties imposed on companies that commit Form I-9 infractions, it is important to understand the new document. Failing to complete the new form properly could result in detrimental fines for U.S. employers ranging from $216-$2,156 per form. So, what is actually "new" about this new Form I-9? USCIS has introduced a number of changes to the Form I-9 to aid employers in properly completing the document. The New Form I-9 has changes to both its formatting and structure, as well as to the completion process. The most obvious change is that the form fields can be completed digitally with the use of a PDF viewer application. It's still possible to use a paper version of the new form, but not all of the updates will be included. In addition, it's important to note that the Form I-9 used should be the most recent iteration. · A new question to determine if one or more translators assisted with completion of Section 1. All translators and preparers who assist must complete a certification. These certificates - which must be signed by the aforementioned individuals - are automatically generated by the new Form I-9 when completed digitally using a PDF viewer application. There is a supplement to the revised Form I-9 for individuals who choose to use a paper form and complete it by hand. · Immigrants authorized to work in the U.S. are no longer required to list both their foreign passport number and Form I-94 number. Aliens authorized to work are required to only provide one of the following: An Alien Registration Number/USCIS Number or a Form I-94 Admission Number or a Foreign Passport Number and Country of Issuance. Although the new I-9 may slightly reduce human error, it does not quite compare to an electronic Form I-9 solution. Form I-9 compliance software also allows the Form I-9 to be completed electronically and offers additional benefits.The newly revised “Smart” version of the Form I-9 does not allow for digital signatures, so although fields on the form may be completed with an electronic device, the form will still need to be printed in order for the form to be signed and stored. Employers using an electronic web-based Form I-9 compliance solution can also complete the Form I-9 digitally, along with the convenience of compliant electronic signatures, secure storage, and easy retrieval of documents. Web-based Form I-9 and E-Verify software solutions, such as those offered by I-9 Advantage, help to ensure that every field of the Form I-9 is completed accurately by validating and error-checking the data in real-time. 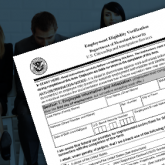 A new Form I-9 is an opportunity for employers to make sure they're complying with federal employment eligibility requirements. The timing of the new Form I-9 is especially salient when you consider the recent growth of Form I-9 audits and increase in fines. With higher fines and a new form, it is crucial that employers take every step possible to make sure 2017 comes and goes without Form I-9 related violations. Disclaimer: The contents of this article are intended for general informational purposes only and are not intended for specific application to any particular set of facts and circumstances. This Article is not a substitute for legal counsel on any particular matter, nor should it be construed as legal advice on any subject matter.